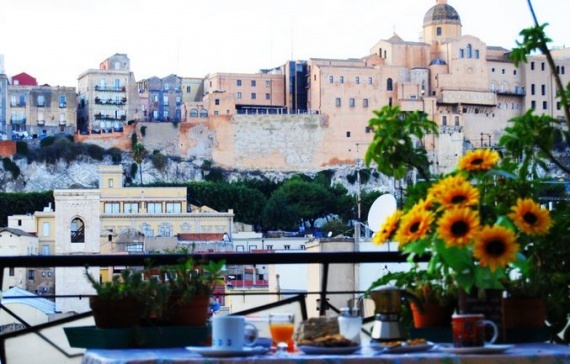 Open BB is a quiet, bright and panoramic Bed and Breakfast situated at the last floor (8th) in a building in Cagliari downtown. (a 20 minutes’ bus ride from the airport and the Poetto beach). The area is very well served by city buses. Within walking distance you’ll find a post office, banks, the shopping area, restaurants, pubs and cafés and Piazza Yenne, meeting point and core of the city nightlife. We offer two double rooms. There is a beautiful panoramic view from the place where the breakfast is served, and you’ll have free access to the terrace. The salon, heart of the house is everytime ready to host you in its comfortable sofas at summer day o working day end. The stay include, Italian breakfast, daily cleaning of the room, linen and towels. Frigo, microwave horn, cofee machine, internet access and WIFI connection.